If you haven’t done that first harvest….then now’s the time to get cracking. The competition this year will include categories for honey, honey comb, pollen, propolis, and wax. Details for each category follows. 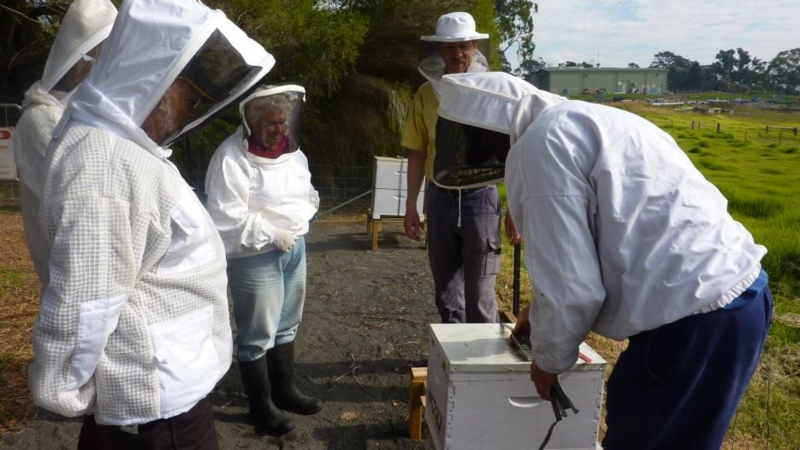 The club will soon be taking on a hive monitoring role for the Department of Primary Industries (DPI), which will be establishing 2 sentinel hives at the Port of Eden. This is part of the National Sentinel Hive Program which was established in 2000 to improve post-border monitoring around Australia for exotic pests of honey bees, including Varroa mites, Tropilaelaps mites and Tracheal mite. The buds are bursting all over the Valley, so regardless of what the calendars say, spring is upon us! 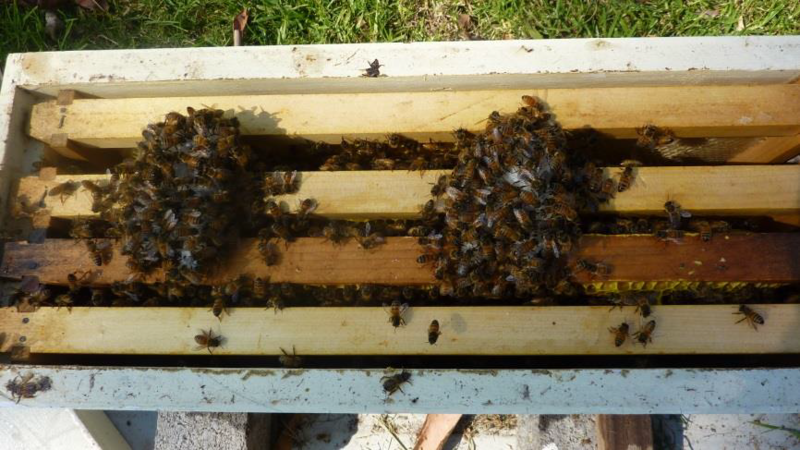 Now is the time to take advantage of those occasional warm still days to inspect your hives. Lyall led a Question Answer session where members shared beekeeping ideas, problems, solutions, myths and funny stories. It was a truly fascinating discussion, and highly beneficial to all beekeepers, whether new or experienced. Just in case you missed the last meeting…. It doesn’t matter how long you’ve been a beekeeper, there’s always something more to learn; and hearing about the existence and role of heater bees was astounding. Adrian described the ground breaking research by Jurgen Tautz in his book “The Buzz About Bees”. Tautz has found that some bees are able to raise their body temperatures about 10 degrees C higher than normal bees by using rapid muscle contractions. Each of these bees then presses its thorax against the top of a developing capped pupa, keeping it warm. What’s even more interesting is that the empty cells we often see in brood nests are used by heater bees. After warming their abdomens, some of the bees climb head-first into these cells where they remain about 30 minutes, or until their bodies drop back down to a normal temperature. A heater bee tucked down in one of the empty cells is even more effective at distributing heat to the developing pupae. Something you may have noticed in your own hives are darker cells within the brood nest which contain a liquid. No it’s not some slimy disease – in a healthy hive it’s likely to be a honey well which is the fuel source for heater bees. According to an article on this topic in HoneyBeeSuite – A better way to Bee, beekeepers have often been selecting against queens who leave empty cells in the brood area – believing them to be of inferior quality. It seems this isn’t necessarily so. Members were riveted by the presentation. Adrian’s parting advice is to be cautious about opening up the brood box too often – twice should be enough for a regular health check. The committee has decided to increase the number of hard copy beekeeping resources available to members. Publications will be available at monthly meetings and these can be borrowed for a month. Members will need to record their loans in a library register which will be kept with resources. Loans will be on an honesty basis so please remember to return borrowed material at the following meeting. The growing trend for many clubs is the use of Facebook to share information with members. This doesn’t mean members will have to sign up to Facebook – it simply gives the opportunity for members who do use Facebook to share information with others about beekeeping which they think may be of interest. Garry Mallard will act as administrator and send members information about how the site will be managed and the process for uploading information. The Department of Primary Industries has approached the club regarding monitoring of sentinel hives at Eden. This is an important part of the region’s biosecurity strategy; particularly in the detection of the Varroa mite. Discussions are in progress and we’ll keep members posted on the outcome. A working bee at the apiary on Saturday 13th May saw completion of the hive pad and fencing. Many thanks to Graham, Lyall, John F, Damian, Margaret, and Suellen, for their efforts. Both hives are doing well and have taken to the sugar blocks prepared by Garry. Thanks to Graham and Jan for the great morning tea. John modelling the latest fashion in personal protective equipment…..what about the legs? Glasses found – but somewhat damaged - are these yours? 13th June 2017 – The learning topic for June will “Registering your hive with the NSW DPI” and “Media resources for beekeepers”. Once again anyone who can bring a contribution to supper will be much appreciated. All the best in beekeeping!